A recall campaign in Colorado led by gun-control opponents succeeded Tuesday in ousting two Democratic state senators — one of them the president of the state Senate. The hard-fought election, which attracted money and attention from across the country, became a symbol of the nation’s continuing divisions over gun control versus Second Amendment rights. Those divisions are exceptionally close, and have been since 2009, according to a series of surveys by the Pew Research Center. For many years beforehand, clear majorities of Americans had said it was more important to control gun ownership than to protect the rights of gun owners. But the gap between those two positions narrowed sharply in 2009 and has largely remained that way: In the 12 times we’ve asked the question since April of that year, only twice (in the wake of the school shootings in Newtown, Conn.) has the difference between the gun-rights and gun-control positions exceeded five percentage points. In the most recent survey, from May, 50% said gun control was more important and 48% said protecting gun rights was. But those close divisions miss an additional dimension that often can swing elections like the one in Colorado: intensity of feeling. 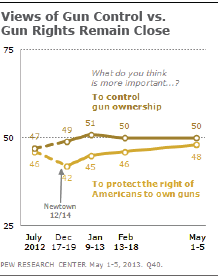 And there, our data show gun-rights supporters have a clear edge. According to the May report, 41% of people who prioritize gun rights said they wouldn’t vote for a candidate with whom they disagreed on gun policy, even if they agreed with the candidate on most other issues. 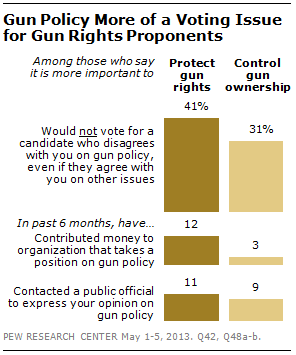 Only 31% of gun-control supporters said gun policy was a make-or-break voting issue for them. 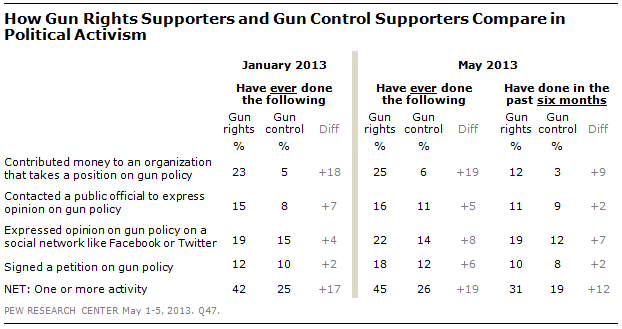 Gun-control supporters also lagged gun-rights proponents in political activism, the survey found. Fully 45% of gun-rights supporters had taken at least one of four listed actions related to the issue, including 31% within the previous six months; the corresponding figures for gun-control supporters were 26% and 19%. Intensity of feeling can be especially potent in low-turnout elections, because the most passionate supporters (or opponents) of a candidate or cause are more likely to vote. And turnout was low in both Colorado recalls: According to The Denver Post, 17,845 people voted in Senate President John Morse’s recall, 37.8% fewer than in his 2010 re-election (itself a low-turnout contest, the newspaper said). In Angela Giron’s recall election, 34,556 people voted, 23.4% fewer than in the 2010 election that sent her to the state Senate in the first place.